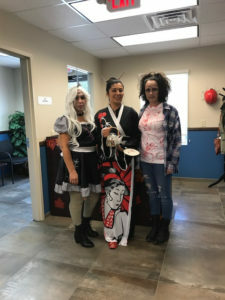 The folks at Kuehne celebrated Halloween with a luncheon and costume contest. The costumes were all outstanding, which challenged the judges to pick winners. Pictured left to right: Julia Rodriguez – 1st place, Viviana Mendez – 2nd place and Kelly Ward – 3rd place. They were awarded prizes. It was a fun filled event!